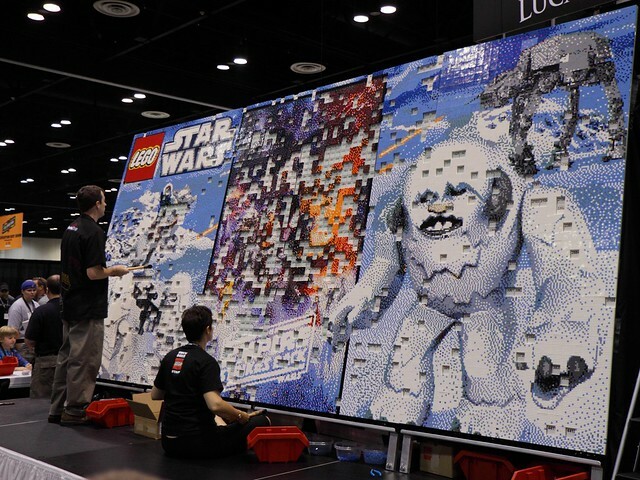 People participating in making this large mural received a Bobo Fett Lego minifigure. My brother informed me that he wanted a Boba Fett Lego minifigure and that they were handing them out at the fifth Star Wars Celebration convention, which was to take place in Orlando. These things don’t often happen close enough for me to drive to them. I decided to attend yesterday (Saturday) and get lots of pictures of costumes. After all, if I just got the minifigure, it would be a very expensive minifigure. Instead, it is just expensive: $60 admission ticket, $32 gasoline, $12 crappy lunch, $8 dinner, and plenty of driving. I managed to get 1208 pictures filling 23.6GB, including plenty of costumes and Lego creations, and drained a camera battery before I finished. I even got sore shoulders and knees. I did also get the minifigure, but I don’t have a picture of it yet. There were quite a few people in Boba Fett costumes, a Boba Fett made of Lego, and a guy who’s Boba Fett costume was made largely of Lego. It’ll take me a while to go through all those pictures. As usual, most aren’t worth keeping, but that is why I take so many. It must have taken my computer six hours or so to produce JPEG images from the Canon specific CR2 image files I brought home. I have my doubts that the software Cannon supplies does the conversion in an efficient manner. 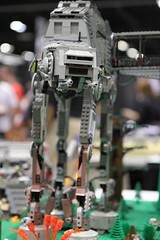 The Greater Florida Lego Users Group (GFLUG) had a huge display of some great models. I found it much more interesting than what the Lego company brought because of the number of models and the size of their minifigure scale city. I think the city was called a “blended Coruscant”, which evidently means some Star Wars models put on buildings modeled after Tampa. I spent a lot of time circling their display and taking pictures. They had pirates, city dwellers, and Batman minifigures mixed in, and Santa, too. There was one minifigure that looked like Leeloo from the Fifth Element, which I didn’t expect since it isn’t an official Lego product. I tried to get some use of my flash unit, but it is a tricky thing to get right without harsh light wrecking the picture. It seems that, without a diffuser, the best approach is to use flash compensation to limit the brightness of the flash, and not use the flash on reflective objects. I spent plenty on a zoom lens that is good for available light photography indoors, but when a flash works well it often improves the image. A camera upgrade could help now, too, but I’m not going to spend the money just yet. Someone had a backpack with PVC pipe holding a flash with a diffusing umbrella above him and used a radio trigger. I think that might work quite well. 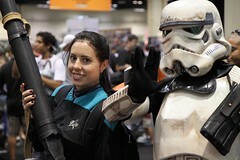 This post has little to do with slave Leias, but we can't have Star Wars conventions without them. The Lego bricks are reflective enough that the flash was often detrimental, so it didn’t get much use at the GFLUG booth. I knelt to get pictures with a low perspective at the booth, but because of the guard rail around it I couldn’t put an elbow on a knee to help steady the camera. I needed some more height, so I ended up standing on my knees. I’ll have to put knee pads on my list of photographic equipment to get. I was surprised by how many people had DSLR cameras, but they usually had entry level or old stuff. I thought the cheap digital cameras would have prevented such a showing. It is a good sign, though, as they’ll help keep my photography hobby costs down through economies of scale. I was also surprised by one person wearing a Star Trek costume. Not a t-shirt, mind you, but a complete costume. 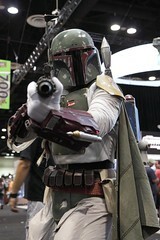 It wasn’t the most elaborate costume, but it was at a Star Wars convention. I have yet to wear a costume to one of these conventions, but I did wear a t-shirt with the old Lego space man/organization symbol on it. No one at the GFLUG booth mentioned it, but I got the impression that the guy in the Boba Fett costume made with Lego took notice. He seemed to be one of the GFLUG members. I also got complements on the shirt from a couple people working at the official Lego booths, a rebel pilot, and several other people. One of them even took my picture. That was different. Other interesting shirts I noticed included yellow uniform from the original series of Star Trek, an Atari logo, and one for Weird Al’s tour featuring “The Saga Begins”.